For less than the cost of a box of premium golf balls. used by the top players and taught by golf's top instructors. Your How-To guide for better ball striking - Part One. An introduction to Thumbs Down® The POWER MOVE of Golf, the miracle that cured my out of control slice. Highlights in detail the importance of squaring the golf club at impact as the #1 swing priority. A simple method any golfer can teach themselves in minutes, Thumbs Down uses hands, wrists and forearms to put the club in the ideal hitting position for more distance, accuracy and control. 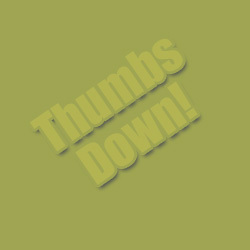 Numerous illustrations show the world's best players demonstrating their use of Thumbs Down. • Pocket-sized paperback How-To guide, customized with your logo, personalized pages and message(s). • Instructional video download, "The Role of the Hands in the Golf Swing." **Available only as a promotional item or for corporate and charity fundraising golf events. A unique and complete "how to" package for better ball striking. What's in it for you? Increased distance, accuracy and control. 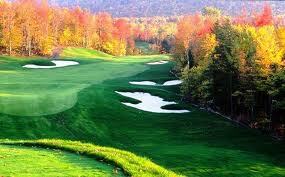 Take a virtual golf lesson by replaying the images in your mind as you play. It's your on-course training aid that's legal under the rules of golf. In golf, it doesn't get easier than this! 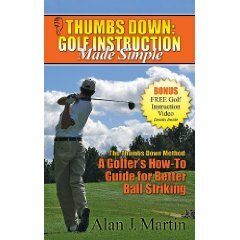 • Instructional video download: "Inside Golf"
• One-on-one Virtual Lesson with Alan Martin, Thumbs Down author and inventor. 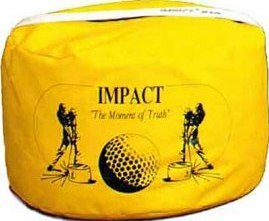 • Instructional video downloads: "The Role of the Hands in the Golf Swing" and "Inside Golf"
• PLUS Dr. Gary Wiren's Impact Bag. The world’s #1 most used and user-friendly training aid of PGA Professional teachers. Copyright 2012 AJM Marketing Enterprises, LLC.